How does the government shutdown in the United States affect research projects at universities and national labs? Has federally funded research at universities and work done at the national labs in the United States been halted due to the government shutdown? If so, what typically happens then? Do researchers just stay at home and not show up to work? Or do they show up, and do something similar to what you would see at a labor strike, e.g. megaphones, demonstrations, make demands? The current shutdown affects federal employees - and even then, not all government departments or agencies are affected. In particular, the Department of Energy, which funds the DOE National Labs, already had an approved spending bill, so DOE is unaffected for now. 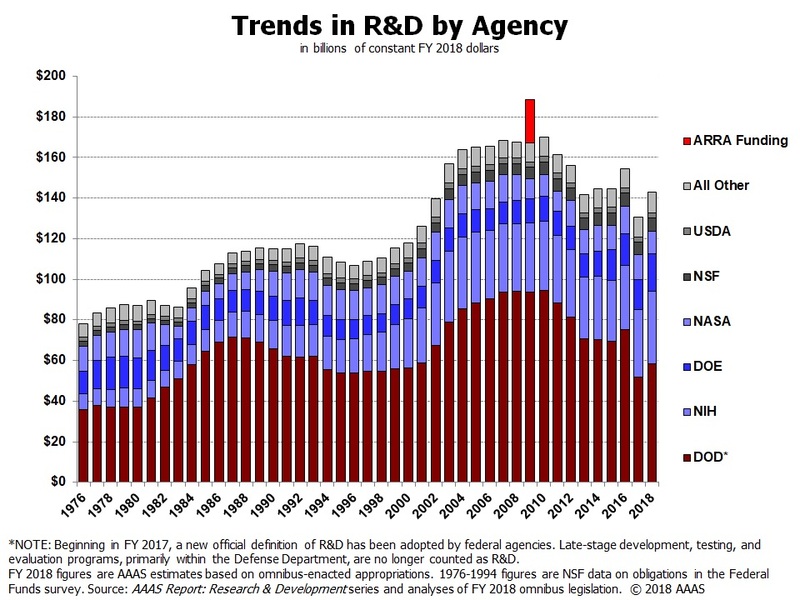 The NIH and Department of Defense, which fund their own institutes and labs, are in the same situation. However, many other institutions, including NIST, NASA labs, and the Smithsonian have had to cease a lot of their work. Some activities are considered mission critical, and can continue, but that's getting into the specifics. See e.g. this Washington Post article. University researchers are not directly affected, since they are not federal employees*. Even public universities in the US tend to be on the state level. However, there can be a large indirect effect since e.g. NSF, a large funding agency, has shut down. If this shutdown is anything like the 2013 one, this will not only delay grant applications, but also grant decisions, causing a lot of uncertainty, hiring delays, and lost research productivity. *The military academies might be an exception, but since the Department of Defense had its spending bill approved they probably wouldn't be affected anyway. Generally the former - at least at the largest of the affected places security would (rather sensibly) be considered a mission critical operation, and security would be instructed to stop people from going to work. There tends to be some protests, e.g. at the White House during the shutdowns, but I doubt these are dominated by researchers. There are many, many others affected - some 800 000 government employees in total, many who'd be hit harder than your average federally employed researcher. The answer of Massimo Ortolano is correct as it applies to federal government run (owned) labs. But the situation for Universities is different. These are not federal government owned or run in any sense. Federal government employees are not allowed to work during a shutdown unless they are required to work (being "emergency employees"). But faculty members aren't federal government employees, so they may continue to work as usual. State government is largely disjoint from federal and state employees work for the states, not the federal government. Universities get grants from the government to carry on some research. The funding for those grants may already be "in hand" in the university. If not, checks won't be written so the flow of funds will stop until the "crisis" ends. This latter might cause some disruption, but in many places the university will just carry on. University professors and researchers will continue to get paid as usual. Money to support laboratories may be problematic if it goes on too long, but that is unlikely. Note that the US federal government fulfills its contracts. To do otherwise would be so disruptive that the US would fall immediately to "developing nations" or even "pariah" status. The main issue will be timing of payments. I currently work in research administration in an R1 university in the United States. Federal agencies are not granting new awards. This is stressful for researchers waiting to find out whether they are being awarded any funds. In the end it probably won't change the total amount of funding anyone receives, but it will delay when those funds become available. We often request information from administrators of federal programs regarding on-going research. Those people are currently unavailable to answer our questions. For example, grants typically have restrictions on what can and can't be purchased. If a researcher wants to purchase something and we aren't clear on whether it is allowed or not under the grant's terms, then some aspect of the research may be delayed until the federal agent can answer our questions. I'm not in the US, but I have friends and colleagues who work for a major national institute in the US. They shut down the experiments and stay at home, temporarily unpaid: in fact, they wouldn't be even allowed to enter the premises. They don't do demonstrations. At NASA Ames, there are many contractors who hold professorships at other universities, e.g. CMU, UC Santa Cruz etc, their official employers. I got to know about government shutdown in 2013 or 2014 when a collaborator told me they had to do the telecon from home. Many of their colleagues just went on a vacation, it was just like an unpaid leave, but this collaborator still had many meetings, many paper deadlines, so they just had to work like a normal day, but from home. Even worse, the Ames Child Care Center, located in the NASA campus, is also somehow related to the federal government and was also shut down. So that collaborator had to take care of their child during that period. It was not an easy time for them. How does the US government shutdown affect academics? How will the 2013 US government shutdown affect NSF postdoc applications? Are faculty positions more competitive than government research lab positions? How much public funding do private universities in the United States receive, directly or indirectly? Does anyone monitor/support public-sector scientists? What would my Higher National Diploma be considered in the United States?